The Sunseeker London Group attended boot Düsseldorf from the 19th to the 27th January, and what a show it was! We had a beautiful range of Sunseeker’s on display, including the show debut, 74 Sport Yacht, Predator 50, Manhattan 52, Predator 57, Manhattan 66, Predator 74, 76 Yacht and the 86 Yacht. Thank you to Chase Distillery for supplying our VIP area with gorgeous drinks for our guests! From day one many clients, guests and press were encouraged by the stunning array of Sunseeker boats to visit our stand, including Prince Albert who joined us on Blue Motion night! 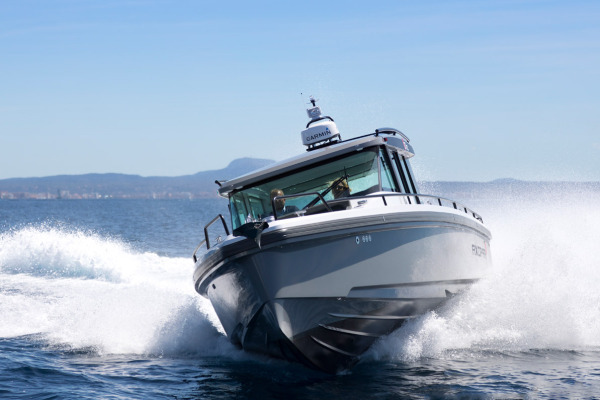 New, current and brokerage models were all favourites with clients, showing as ever, the timeless name ‘Sunseeker’ maintains its position as market leader. Day by day sales rocketed – seeing £40m worth of signed retail sales throughout the duration of the show, and with sales still coming in we are predicting £50m worth of sales by the end of next week, a fantastic result for the Sunseeker team. 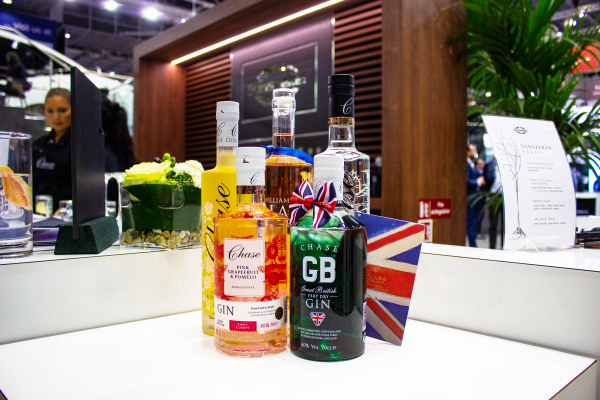 The Sunseeker London Group would like to say a special thank you to all of our partners, the Sunseeker stand was excelled by these brands, adding a little extra for our VIP’s to enjoy. • Alexander James Interiors – Alexander James Interiors enriched our Sunseeker boats with their exquisite and award-winning styling. Using a variety of colour palettes throughout the stand, each boat was uniquely and beautifully styled. • Jo Malone – Each Sunseeker Luxury Motor Yacht was furnished with signature fine fragrance candles and diffusers from the British perfumer Jo Malone. Pomegranate Noir, English Oak & Redcurrant, Peony & Blush Suede are a few of the brands trademark collection that featured in the living areas as well as our exclusive Sunseeker VIP lounge. • Chase Distillery – To keep our clients refreshed throughout the day our exquisite Great British brand partner Chase Distillery served our VIP owners lounge with a selection of gorgeous refreshments, including their popular Pink Grapefruit & Pomelo G&T. • Venom Design – We were also delighted to welcome Venom Jet Ski’s to the stand to showcase their customised Sea Doo in true Sunseeker style! Whether it’s custom-made leather seats or carbon fibre handle bars, Venom Design specialises in creating bespoke Jet Ski’s to suit the clients needs using the highest quality materials. • Williams Jet Tenders – Many thanks also must go to our long standing partner Williams Jet Tenders, for displaying their ever popular water toys on the Sunseeker stand. 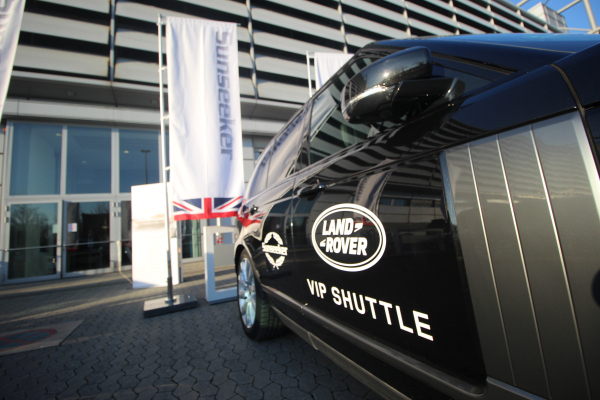 During boot Düsseldorf our guests were transported in style! Thank you to Jaguar Land Rover, every year their service and luxury vehicles do not disappoint! • Jaguar Land Rover – Acting as our chauffeur service for our VIP’s was our brand partner Jaguar Land Rover, who supplied us with 4 of their stunning vehicles along with 4 drivers. Every year their service and luxury vehicles do not disappoint! • Port Adriano – Thank you to Port Adriano for joining our stand to educate Sunseeker clients on one of the most exclusive marinas in the stunning island of Mallorca. Port Adriano has a total of 488 berths and 87 moorings that are dedicated to yachts and super-yachts. • Ruschenbeck – We would also love to thank our wonderful partner Ruschenbeck, who showcased some beautiful jewellery on the stand for our clients throughout the show. Our VIP’s were drawn to their glistening display adding that extra bit of glamour to the show! • Heirlooms – Blending the finest materials, creativity, skilled craftmanship and meticulous attention to detail, Heirloomscomplimented AJI’s dressings on the Sunseeker stand by adding their gorgeous linens and throws on our boats. • MEROS – Thank you to our long standing partners MEROS for joining our stand once again. MEROS, co-ownership narrows the gap between charters and the out-right purchase of an own yacht. During boot Düsseldorf, this opportunity was offered to our clients who visited the stand. • Deluxe – Deluxe enriched our stand by providing beautiful tableware on board our stunning 76′ and 86′ yachts. They dressed the boats with Sunseeker inspired gold etched plates with signature Sunseeker laurel, complimenting our boats perfectly. • Hondajet – As Sunseeker owners are accustomed to travelling in style, Hondajet was able to offer fantastic services to our clients. When you dock your yacht, your private jet should be just as stylish and advanced. That is why Sunseeker has teamed up with HondaJet Central Europe to introduce you to the new HondaJet Elite. • Mannheimer Versicherungen – Our brand partner Mannheimer Versicherungen have been working with Sunseeker Germany for various events, and we were delighted to partner with them once more for boot Düsseldorf. • Linea Mare – Thanks also goes out to our brand partner Linea Mare, the luxurious lantern company for enabling the Sunseeker stand to shine and sparkle for our guests even more! 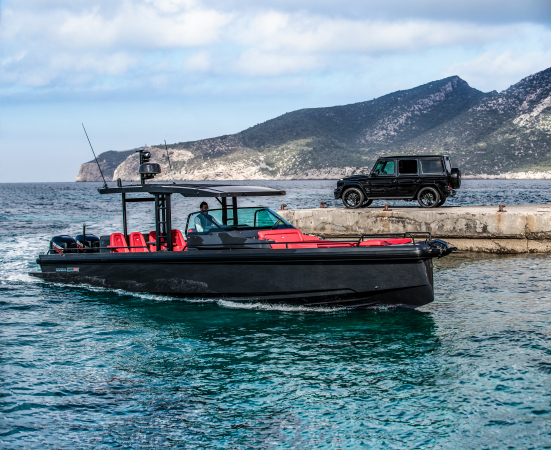 The Sunseeker London Group are thrilled to officially announce that we are now Axopar and BRABUS Marine dealers! 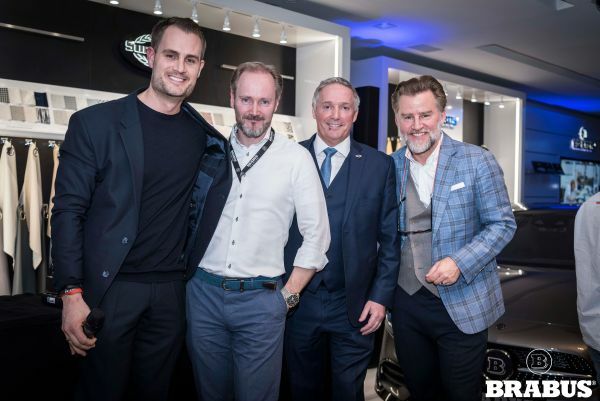 Pictured here – BRABUS CEO Constantin Buschmann, Axopar CEO Jan Erik Viitala, and Christopher Head Sales Director of the Sunseeker London Group. During boot Düsseldorf, on the 25th January we hosted a BRABUS Marine event at Königsallee, where Sunseeker Germany have their flagship showroom in conjunction with luxury automotive brand BRABUS. On the guestlist were our Sunseeker London Group, Axopar London Group, and BRABUS Marine London Group clients and friends, who joined us for a wonderful evening drinking cocktails and dining on delicious canapés whilst listening to the sweet sounds of DJ AXLNT. Our guests were able to explore some of the exquisite bespoke BRABUS cars on display in the showroom. 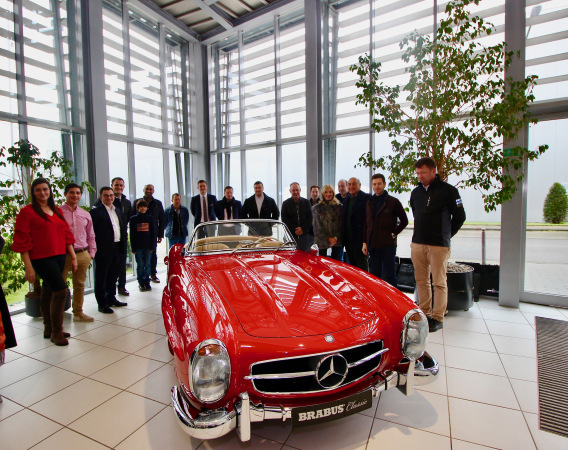 During the week of boot Düsseldorf, we were also able to provide our clients with the opportunity to explore and experience the BRABUS Factory tours. What an amazing show boot Düsseldorf 2019 was! Thank you to everyone who attended and made it so spectacular. We now look forward to The Sunseeker Showcase, from the 25th-28th April. We hope to see you all there!